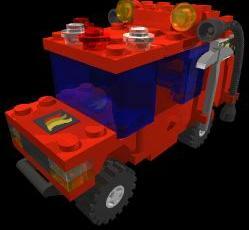 This is a page of apparatus that has been retired from service by the Legofield Fire Company. Rescue 2 is a modified version of LEGO� set 6666. Rescue 2 is a light transport, meaning that it carries no equipment besides a stretcher. If a patient needs medical attention during transport, either Rescue 1, from Station 1, will be called in, or the first aid or als equipment on Engine 2 will be used. The main reason Rescue 2 was purchased was because of its 4wd capabilities. In the instance that medical equipment is needed on an off-road rescue, the equipment will be supplied by Heavy Rescue 2 or brought via Truck 2. Rescue 1 was designed after a 1992 Ultimaster. It is a light rescue/ambulance which seats a crew of two; the driver and a rear facing attendant. If necessary, Rescue 1 can carry a life raft on its roof. Rescue 1's equipment consists of a first aid kit, a trauma kit, an oxygen bottle, a two way radio, a shovel, and a rescue saw. Ladder 1 has a crew of one. It was donated to LFC by a neighboring department who was looking to give it a good home as they had just purchased a larger hook & ladder truck. Brush 2 is a customized pick-up style Hummer. Brush 2 carries a pump and three draft hoses which supply water to a hose reel. The cargo area is accessed by swiveling the rear deck. The chassis for this model was designed by Bram Lambrecht. Engine 1 is a first responder engine. It has a cab which seats three. Engine 1 responds to every call and is manned by three crew around the clock. Engine 1 has an inlet on both left and right sides, and discharges on the right side and the front bumper. Car 1 is a two person crewcab pickup truck. Its tools consist of a dry chemical fire extinguisher, a SCOTT� air pack, a rescue saw, and anything else that might have been added during the last use. Car 2 is the Battalion chief's car which is stationed out of Station 2. Car 2 is a customized Subaru Forester. Car 2 has an opening rear hatch to access the cargo area. Utility 2 is a one-man utility truck, as its name implies. Utility 2 is used mainly on extrication and water related calls. Although all of the truck's standard equipment is stored in compartments, there is room on the top of this area for more tools. This area was originally a hose bed because before being bought by the Legofield Fire Company, Utility 2 was used as a hose truck. Engine 2 is a slightly customized Sixby Vision Pumper with a crew of three. Engine 2 is first responder, responding to all calls. It has basic, but essential, firefighting tools and also carries advanced life support equipment.